In ancient Athens, the purpose of education was to make citizens that were trained in the arts, and to prepare them for both peace and war. It was here that many of the advances in Ancient Greece stemmed from. They began their studies at around a similar age children study today. As many parents teach their children before they began they begin their years of schooling the Athenians would do the same from birth till about age 6 or so,young boys were taught at home by their mother or by a male slave. Then following their schooling at home they would attend a neighborhood primary school or go to a private school if they were from a wealthier family until they reached about age 14. Books were very expensive and rare, so subjects were read out-loud, and the boys had to memorize everything. To help them learn, they used writing tablets made from wax and rulers. For their lessons, the students used a wax-covered board with a stylus to carve out letters in the wax. When completed, the wax was smoothed over again and reused. In primary school, they had to learn two important things - the words of Homer, a famous Greek epic poet, who wrote the two epics the Odyssey and the Iliad and how to play the lyre. Their teacher, who was always a man, could choose what additional subjects he wanted to teach. He might choose to teach drama, public speaking, government, art, reading, writing, math, and how to play another ancient Greek instrument - the flute. Following that, boys attended a higher school for four more years. When they turned 18, they entered military school for two additional years. At age 20, they graduated. Girls were not educated at school, but many learned to read and write at home in the comfort of their courtyard. 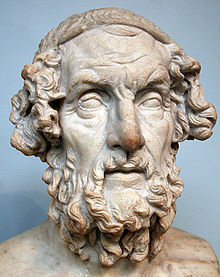 Homer a famous Greek epic poet, who wrote the Odyssey and the Iliad. Definition: a stringed instrument like a small U-shaped harp with strings fixed to a crossbar, used esp. in ancient Greece. Modern instruments of this type are found mainly in East Africa.